Discussion in 'KJ General Discussion' started by gespo04, Apr 12, 2019. Hi there everyone. I am the proud new owner of a 2003 KJ with the 3.7L V6, and a 5 speed manual. This car did not come with the factory towing package, however it has a uHaul 2 inch hitch with what appears to be a 4-pin harness attached to it. I presume it is a class 3 hitch due to the harness and the size of the hitch but I don't know how to confirm that. The manual and some light internet research tells me that this car as-is should have a towing capacity of 3,500 lbs. I would like to increase that a bit so I could tow a small RV. I think closer to 4,500-5,000 lbs would be ideal. I recently nabbed the HD trailer towing package parts (Electric fan, fan shroud, mechanical fan, fan clutch) from a junkyard and was going to have them installed next time I take the liberty to a shop. - Will this HD cooling package be enough to provide enough transmission cooling to effectively increase my tow rating? - Would the 5 speed manual be able to handle higher loads even with the improved cooling system? - Would I need an auxillary transmission cooler, or heavier duty OME springs as well? - Am I an idiot for thinking any of this would work? .... manuals don't HAVE a cooling system... they don't NEED one. and while I do tow (far) more than the 3500# rating on occasion, there's question on the legality of it, and you damn well better make sure you have braking on the trailer itself. you should also upgrade the brakes on the jeep as well, as a safety measure. Sota is right there may be a question of legality. I'm not sure if your GVWR only allows you to tow 3500# because that's what the factory made it for or if it came with the towing package then the GVWR would allow 5000#. Not really sure about that, but you may want to check. I tow regularly too, and 5000# is not "easy" for the Jeep. It will slow down on big hills if you don't get on the gas way early. You will get +/-10mpg. Also, 5000# is more than the Jeep itself weighs, so you absolutely need a trailer with brakes and a brake controller. I would also say getting a weight distribution hitch is necessary at that weight, as it won't push you around as much, and it levels out the vehicle which allows for safer handling and proper braking. The Liberty is definitely a mule, and I'm not going to say what you want it to do can't be done, but it's going to cost ya if you wanna do it right. I would just recommend going on the lighter side if at all possible. Here is my Jeep attached to the trailer with about 4800lb in the trailer. The top is w/out the weight distribution hitch, and the bottom is with the torque bars on. You can see how much of a difference the hitch makes. 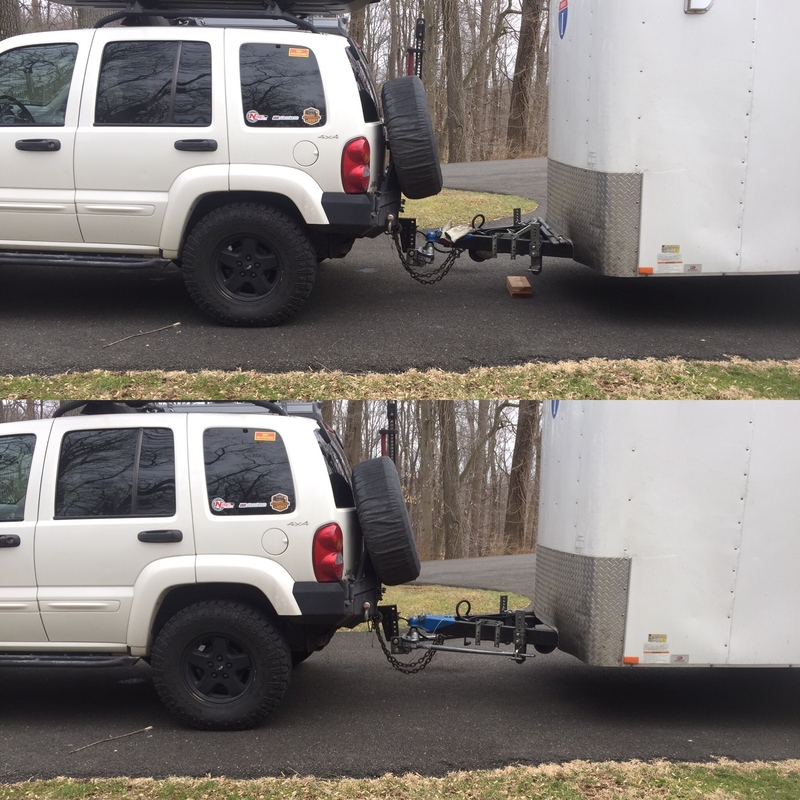 The hitch changes how the Jeep brakes, and rides. No better advice to be given that what was just posted... I towed a 7,000lb Tahoe 4x4 with my KJ.. it was not fun, I would not do it again, but it did it.. the only casualty were my brake rotors.. warped to hell and back trying to stop 11,000lbs total. It's my opinion that the KJ should not ever tow more than the vehicle itself weighs.. even though it can and you could, you should try to avoid it, and certainly not as regular course with an RV. I'd rather buy a cheap gnarly old pickup or Bronco/Blazer style vehicle for that... even a beat up $1000 old Tahoe (which my father in law just got for his 2001 on trade-in for a nice shiny 2017 model). Brakes on the trailer/RV itself are a must.. even those old inertia operated brakes with the plunger to activate (as opposed to electronic) would be a huge help. Not being able to safely and precisely brake that much moving mass is a HUGE liability and disaster waiting to happen. ... were you flat towing it? I mean I came in at 10,060# that one time, with jeep, trailer, car, tools, spares, all the other trimmings needed for a 3 day track event. Barely 1000# more than that for a Tahoe?? I thought those things were pushing the 3 ton mark. And as for trade in's... now you know why I don't bother selling anything, and just drive them until they're under the ground. Flat on rural 2-lane highway. Curb weight for a 2000 Tahoe 4x4 is just over 5200lbs. 6000lbs would be 3 tons, so I figured with all the crap loaded in the tahoe, plus myself and the tahoe driver, 7000lbs added. Probably off, but probably not by much. Also, yes on trade ins! He was glad to get the $1000 for it, even with 210k miles and a few issues. Although, I bet whomever buys it that the transmission is gonna die in the next year.. original fluid and filter on that thing. eek. yea but if they change the filter and fluid now, it'll DEFINITELY kill the trans.